You are working in a warehouse when you hear cries for help in the next room. Since you know First Aid and CPR, you walk into the room to see if you can help. You find several co-workers standing near your friend, an electrician, lying on the floor. You notice a pair of wire cutters lying near your friend's hand and several arching wires near his head. He does not respond to you calling his name. How would you respond? The answer is in the CPR Case Studies Answers section of this course. You are at a local swimming pool when lifeguards pull an unconscious middle-aged male from the water. You inform the lifeguards that you know CPR and can help. They begin the steps of CPR and direct you to call 911 and get the AED. After calling 911, you return with the AED. The lifeguards ask you to apply the AED, but you notice the patient is still wet from the pool. Another bystander yells out that you can't use an AED on a wet victim. What should you do? You are enjoying dinner with your family at a local restaurant when the woman next to you abruptly …. Look for chest rise (indicating breathing), listen for grunting, groaning, or sounds of heavy breathing, or place your hand on the patient’s chest to feel for rise and fall. 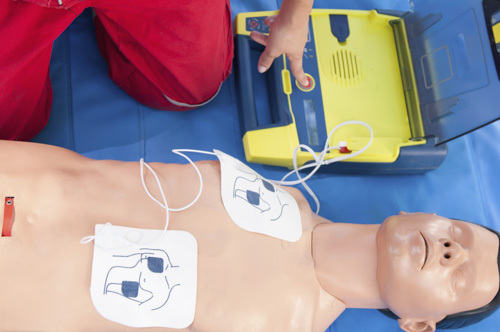 Advanced provider: check for pulse, airway, and breathing issues. A seizure is caused by abnormal activity in brain cells. This can cause a victim to suddenly begin experiencing severe muscle convulsions in an area of the body or even the entire body. In many cases the victim loses consciousness during the convulsions which can often continue for several minutes after the convulsions have stopped. Seizures can be caused by conditions such as epilepsy, a dramatic drop in blood sugar, and even simply due to a high fever especially in children under five.